You see the pictures, and you read the stories, and you think you can understand. And then you arrive in Joplin, and drive down 20th street, and stop in front of the old high school. There are Eagle sculptures out front, carved from the remains of shredded trees. 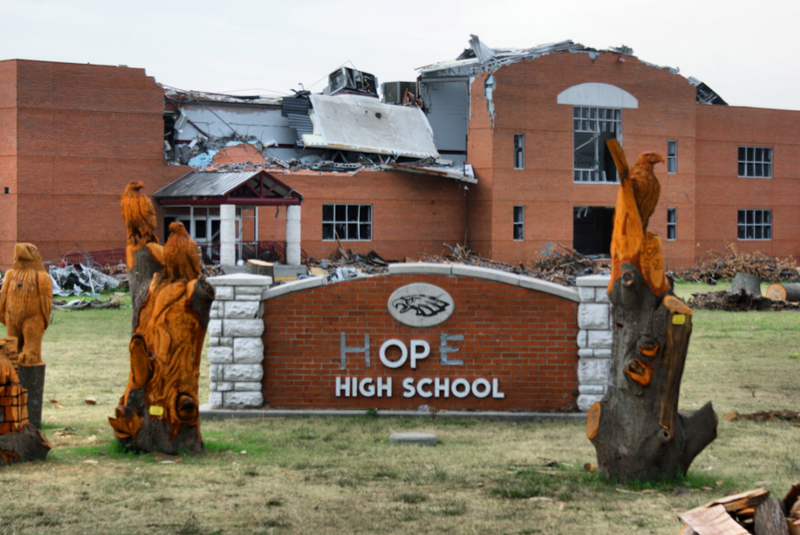 The rubble sits behind, one of the biggest high schools in the state laying in ruins. And these are just words, and the photos are just photos. And you can’t explain it. I had driven down to Joplin to work on a story about a Joplin High School senior named Quinton Anderson. Quinton Anderson is like most high school seniors. He played football for three years, hauling in passes as an undersized wide receiver. … The other day, he wore a shirt and tie to school because he had a job shadow for his business class. … He wants to major in molecular biology. Maybe help people cure vaccines. But to the people of Joplin, Quinton Anderson is not just a normal high school student. He can’t be. Not now. Not after all he’s been through. Here, in this town, Quinton Anderson is a living, breathing, walking symbol of hope. By now, most in town know Quinton’s story. Nearly every day, he says, someone asks to hear it. On the day the tornado hit, Quinton was at home with his parents, Bill and Sarah. Quinton had been fishing. They heard about the storm, and Bill and Quinton went outside to look. A few minutes before the inevitable, the family had taken cover in an inner hallway. Quinton grabbed for one of his dogs. The noise and power overwhelmed everything. And Quinton looked up — and saw only sky. A moment later, something collided with his back. Darkness. For blocks and blocks, miles and miles, the land is still somewhat desolate, an empty horizon. I heard people say these things last summer, that it looked as if a bomb had gone off. And I guess you never totally understand that scene — a bomb going off? who has seen that? — until you’re there, in the flesh. There are shredded Americans flags, still flying in the sun. There are houses abandoned. There is a swath of land, a chunk of memories, cut through the heart of town. A constant reminder of what was lost. These days, Quinton Anderson is thinking about high school things. It’s been nearly six months since the tornado took his parents. He now lives with his older sister, Grace, in Neosho, about 23 miles outside of town. He doesn’t mind the drive but hates wasting all the gas. After spending most of the summer in the hospital, he is back on the football sidelines, an honorary captain for the Eagles. In the weeks after Quinton was released from the hospital, he received a special visitor from Kansas City — Chiefs general manager Scott Pioli. That’s partially what my story was about. So on Sunday night, after I had filed my story, I stumbled upon this video of ESPN’s Outside the Lines report on Joplin. It’s a wonderful piece of storytelling, and it’s worth the time. And near the middle – and at the end – you’ll find Quinton. Near the end of the piece, you’ll hear a song. I had never heard it until Sunday night. It’s called “The Loneliness and the Scream”, and it’s by a Scottish indie band named Frightened Rabbit. can you hear footsteps? voices? i have fallen in the forest. Late last Wednesday afternoon, I pointed my car north and left Joplin in my rearview mirror. I was heading back to Kansas City, a place where we can see the tragedy, and read about the heartache, and root for the recovery. But we can’t feel it. Not totally. For these are just words, and the photos are just photos. And no matter how hard you try, you still can’t explain it. If you go there, you won’t forget.